Penelope is not available for private consultations. 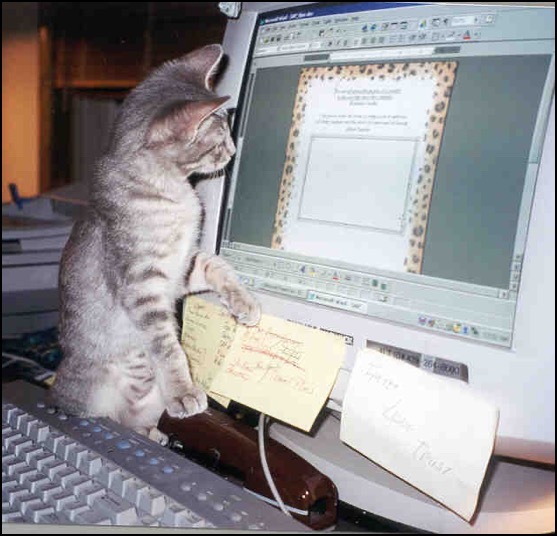 See the Animal Communicator Directory for assistance with your animal friends. Years ago, when I was getting 50-100 calls per week requesting consultations, I decided to stop doing private consultations to devote my energy to teaching and writing (including being founding editor and former publisher of Species Link magazine) to reach and train many more people. It was not an easy decision, as I loved helping people individually with their animal friends, and many people were distressed that I was not available to help them in that way. However, it was a necessary shift to further spread the word of animal communication around the world, as I and my publications traveled the globe. This move resulted in the ripple effect of training fine animal communicators doing great work who in turn reached many more people. Since I had trained many professional animal communicators and knew them well, I could refer consultation requests to them with assurance that they would do a good job. People have continued to ask me to make exceptions and do consultations for them and their animal friends. I have to say no despite their frustration, since this easily opens the door for others to ask to be exceptions. Of course, all people and their animals are special and deserve to have the help they need. Now there are many animal communicators available to help in this way, so I can carry on with the work that I need to do. In training animal communicators, I have always emphasized empowering clients through education that helps them to communicate with animals themselves. It is part of our Code of Ethics found on this page. Each of us doing this work has a unique role, a special service in the field of animal communication as all of us do in our lives, no matter our chosen work. I have held the hub of the growing network of animal communicators through Species Link journal and the animal communicator directory and information on this website for decades, encouraging all to blossom in their service in helping others connect and communicate with all life. In recent years, I have cut back on my outgoing work in general to deepen my own spiritual focus. The fantastic journey of supporting all beings in their expansion with all species and all life goes on, changing its shape and form with time. Thank you for your part in it. 1) Realize that not all communicators are created or trained equally. It takes many years of practice and seasoning to be a good animal communicator. Some of us are excellent at some things, and not so good at other things. 2) No one can make your animals change if they don’t want to. Sometimes the problem isn’t with them. It’s with their people, their situation, their management, their diet, background, breeding, training, or lack thereof! They always do what makes sense to them from their viewpoint. Our job is to discover what their viewpoint is and then to work with you to help resolve the problem. 3) Realize what the job actually is: animal communicators are trained to listen telepathically to animals. We can make mistakes even though we are doing the best we can. We do not predict the future, we don’t know everything, and we are not intending to read your mind. Everything we do is considered confidential. We should be able to accurately understand what your animal is feeling and thinking, what the main issues are from their viewpoint, and be able to present something useful, whether it’s confirmation of what you may already know (which is valuable in itself), uncover new information you didn’t know before, provide clarity regarding direction to proceed with the problem, and be able to answer your questions to the best of our ability. Some problems simply aren’t fixable. If the animals do not want to change or see no need or reason to that they can agree with, then they won’t. You live and work with them 24/7. To expect a stranger (animal communicator) to make animals be different when you continue to reinforce their bad behavior by rewarding it or not making the effort required to teach them anything different is not realistic. 4) What about skeptics? I encourage people and my students to be skeptical. You should listen and observe with your heart, but not be so open minded that you lose your common sense! Not everything that we receive telepathically is going to be 100% accurate; it’s unrealistic to expect it. The best psychics in the world are only about 80% accurate! However, you may notice a change in the animal’s behavior, mood, or well-being or in how they respond to you or their environment. Often they will change positively, just through communicating with them. Some of us do better than 80% at times, and sometimes we are off. Nobody’s perfect. 5) If something feels off in your session or you are being told things you know are not true, please, speak up! Let us know. Don’t worry about hurting our feelings. We would much rather learn from your honest feedback, and be allowed to correct or explain than have you go away unhappy. 6) The next important point to consider is this: We are all practitioners! That means we are practicing, along with other professional practitioners -- including veterinarians, doctors, and other medical professionals. We do our best to assist, given our experience, training, skills and education. 7) So where do you find animal communicators? 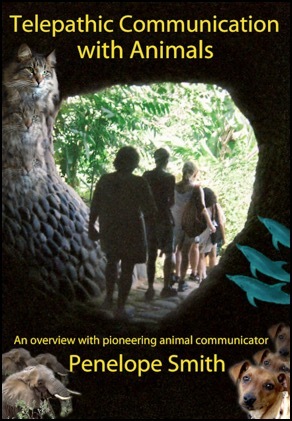 The best place to start is right here, through Penelope Smith’s animal communicator directory. I interviewed Penelope in a very rare media appearance and she was awesome! We were treated to 90 plus minutes of her personal coaching and answering our questions. She even guided us through animal communication exercises. It was like being in up close and personal in an intimate class setting with the #1 Animal Communication Teacher of our time! Many people told me later that the event changed their lives. We recorded this amazing event so you can check that out at Teleseminars. 8) Do your research and choose a few animal communicators that appeal to you. Everyone has their special area of interest and expertise. If you like the look and feel of their website and information, then contact them. 9) Interview her or him. Ask them questions. How long have they been working as an animal communicator? Tell them a bit about what you are dealing with. Ask if they have worked with this kind of thing before. Ask what kind of preparation is needed for a session. While you interview the animal communicator, listen to your own heart. IF you feel good with this person, then make an appointment. 10) Does the animal communicator have any kind of a guarantee for their work? What will they do if things go wrong, or you are unhappy with your session? This will help your peace of mind and helps assure that you will be working with someone reputable and professional. If at this point, all feels good to you, then make an appointment with the animal communicator. Many companion animals choose to spend their lives attempting to break through our barriers, help us heal, and become reconnected with all Life. Animal communication can change your life and improve the lives of your animal friends. A consultation with Penelope Smith, whether in-person or by phone, is an opportunity for direct two-way telepathic communication with your animal companions. You can get questions answered about problems you are having with your animal friends. You can learn to understand their viewpoints better, how they think, what they do and don't understand, and how to treat them to create more cooperation and a better partnership in living or working together. All non-human animals telepathically communicate. This is not something spooky or weird, but it is an inborn ability of all beings, including humans. Most people in this culture are socially conditioned from childhood to deny telepathic communication, and so they lose the ability. Humans who are sensitive, receptive and attentive can recover, develop or increase their own ability to mentally communicate with other species. People call me an "animal psychic," and this makes some people think I know everything about animals or, worse yet, themselves! Psychic comes from the word "psyche," meaning "soul" or "spirit." Telepathic communication is psychic because it's a connection with the soul or spirit of animals—their essence or true self including their thoughts, purposes, values, perceptions, understanding, and other mental and spiritual qualities. It is no different than a heart-to-heart discussion with another human, where both people are really listening and understanding each other. While I can usually perceive a lot about the animal from the first connection, I do not necessarily know details of their lives and feelings until I ask about them. I don't know or care to know irrelevant details about your personal life, so you're safe! We go from what is known about the situation from your viewpoint, to the unknown—what the animal thinks about the situation. I specialize in getting the animal's viewpoint, feelings, perceptions or attitudes by asking them questions and listening to what they think, feel, or visualize. This direct communication may give a whole new outlook on the animal or problems with them and how to handle them. Animal companions are generally very grateful to have their people understand their point of view. You may have received some of the animal's body language or telepathic communication before, but filling out the picture can be extremely rewarding. We work together to resolve misunderstandings, behavior problems, and the psychosomatic aspects of illnesses or injuries that do not respond well to veterinary care. I can sometimes advise on nutritional needs, and I can work to restore body energy balance through spiritual healing. Consultations can be kept confidential, or other people can observe and listen if that is comfortable for you and your animal companions. In the beginning, I will ask you a few basic questions about the animal's name, age, and breed to help me put their answers into some context and therefore understand them better. I can tune in with your animal friends and find out basic matters like how they feel about life, their purposes, concerns, attitudes, or enjoyments, but a consultation is facilitated by you asking specific questions that are important to you. Animal companions may not talk about your areas of concern unless you focus their attention on them. Questions about health, attitudes, behavior, environment—past, present, future, are all welcome. So, please have all your questions ready, written if necessary. If you'd like to record the consultation, have a recorder ready. My ability to comprehend or put into context what the animal is saying is increased if I first have your information about a health or behavior problem. Then, I can get the animal's viewpoint about it, which may be very different than what you think or may fill in the picture of what you or others perceive. Just asking "what's wrong with this horse, dog, cat?" won't necessarily be productive, especially if they don't feel anything is wrong with them or have no immediate pain or stress. A challenging or hostile attitude creates mental static and headaches, and it wastes time and energy. Full communication and receptivity from all concerned is the key to maximum benefit from a consultation. Have an open attitude, whether you are skeptical or not, and you may find, as have many people before you, that your consultation is an interesting and helpful experience. "You came to talk to Snarvik before he was to go to the Grand National. He was the horse who always, or as he said, not always, added an extra stride in the combination jumps. He was wonderful at the show, and never in six days added an extra stride. He also was very calm in the stall for the first time in his life." "My collie, Tex, who you counseled, has completely been healed of distrusting and disliking people. He was able to return to the show ring and finish his obedience degree, pass his temperament test and finish his breed championship. He now has a reputation for loving everyone." "Our cat, May Lynn, had been sick about 5 days. She would just lie around looking apathetic, wouldn't eat, drank very little water, and when she did she would get sick. Penelope came over and talked with her for awhile and told us what was going on with her. After about 15 minutes she got up and was walking around and looked 100% better. The next morning she ate for the first time in 5 days. She was totally well and has continued to do great!" "Since the consultation Grizzely is back to his old self—eating well and not throwing up, being sociable, and he's off the Valium totally with no ill signs (like biting his hair out)." "I talked to Nat, the oldest cat with stomach problems, after we got off the phone. I asked if he liked talking to you and told him I would try harder at caring for his special needs. He jumped up into the cat castle (3 feet off the floor!) and played with a catnip mouse! He seemed very happy!!" "My horse now stands facing the stall door with his head out instead of standing with his head in the far corner of his stall. He has a clear calm eye now and keeps his ears forward. He doesn't wag his head around like he used to, and he hasn't tried crowding me, all since you talked to him." "Since our talk about Momma Bear, the very unhappy long-haired tortoise-shell cat, she has made a real turnaround. She's lovable, she's stopped peeing everywhere, she's getting along with her worst nemesis in our house..."
"Three year old Arab mare, Katie was suffering from fainting-like spells. You clarified that it wasn't a medical problem but that Katie had suffered blows to the forehead, and would now nearly faint when put in a similar situation—small spaces and darkness would trigger her, according to you. I worked Katie later that day and was easily able to keep her from fading by tapping her forehead. After a few successful attempts at stopping her from fainting, she changed—she was brand new and happy. I then thoroughly questioned her owners to find out she had severe blows to the head while badly cast in her stall during the night. Katie went to a brand new home yesterday. When she left she wasn't afraid of a dark stall, doorways, or shadows, and rode quietly in the trailer to her new home. As a trainer, this was the first horse I would have had to send back, in which case she would have been put down. Thanks again." "There has been a miraculous breakthrough in our relationship. I had the talk with Marigold (dog) that you suggested about the roles changing and my being in charge instead of her. I told her what was expected, and she seemed to understand perfectly. Although she continued to test my resolve, she seems so much happier and at ease—almost a new dog." "Baby has been a model puppy since your call. No chewed-up furniture or pillows, no torn bedclothes, etc. A change that seems nothing short of miraculous since I haven't yet bought a playpen or canine crate to confine her in." "Thanks so much for communicating with Fleetwood for me. I feel calmer about him than I ever have. I have spent 3 years wondering and wishing I knew why I seemed to be such a disappointment to him and why he got on my nerves so. The vet said `all Westies are kinetic' and that he'd never outgrow it. No wonder you come so highly recommended." "Thank you for your support in dealing with the loss of my cat, Charlie. I miss him very much and am grieving, but the spiritual understanding helps with the letting go. You helped me a lot, all along the way, in understanding my process with Charlie. He helped me to open my heart." "It's been 5 months since you did a consultation with Cougar (horse). Remarkable changes ensued. The next day his incisional hernia appeared smaller to me... Also, almost immediately, his attitude was visibly more positive more of the time... Then I took him to Davis [medical center] to be evaluated for his readiness for surgery (hernial repair). They recommend waiting to do a repair 4-6 months after the hernia occurs, and it had only been 2-3 months, but he seemed strong and healthy. The chief surgeon examined him and told me he would likely not need surgery and start him gradually back to work. I could hardly believe it... He's also become much more demonstrative with me over the past few months." "My cat Cleroy has gradually quit his spraying behavior since your consultation. He's not sprayed for about 5 months now. I let him out back for brief periods and he's not fought with other cats or had any serious medical problems. We have established more of a trust between us, and he's such a happy cat now." "Fluffy seemed better right after you sent the energy to her, and today the vet said she looked pretty good all considered. Whatever you did it was great!" "Words cannot express my gratitude to you for all you have done for me, my sanity, and my cat, N.T. About one month ago I called you about a spraying problem I was having with her for 3 1/2 years. Well, my problems are gone." "The next time I let Zack out after we talked, he didn't show that he was stiff going down the steps! It felt like my heart opened a lot—I cried a bunch and was really able to feel the connection between Zack and me unclouded by guilt and worry." "Trapper sends his love and thanks for your gentle help in clearing the subluxation in his back. There no longer is heat being emitted to the touch and he is moving much better in the hips. Other than being very thankful it is difficult to express my feelings about the change in atmosphere here since your visit. All of the animals seem either relieved or elated by the fact that we now know that there can be communication." "Thanks. Our conversation and the healing that followed truly helped relieve a great deal of Sage's stress - as well as mine. She's been much more chipper since then and Raea has been helping her! We had a conversation about her great job keeping our home and area safe and happy and about her talents helping Sage feel better. What a difference!" Susan Eirich of Earthfire Institute tells the story of how grizzly bear, Teton, and Penelope communicated and worked long distance together energetically to help heal his paralyzed state. This podcast with Susan Eirich tells more about Teton's healing process. Video introduction and overview of the subject. Eye-opening for skeptics! 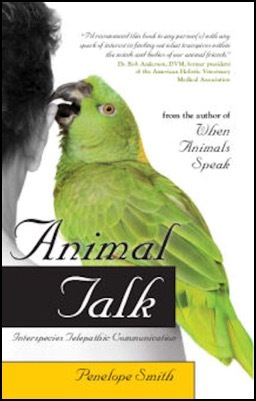 Penelope Smith demonstrates ways of increasing our understanding and harmony with other species and makes clear why it is fundamentally important to heighten our awareness of other animals' spiritual nature and to expand our abilities to fully communicate with them. We witness consultations and interviews with people and their animal companions who have benefited from Penelope's communication, counseling, and healing work. In scenes of courses, we get a taste of techniques that help people regain their power to telepathically communicate with other species. The best way to work with an animal communicator is to re-discover your own ability to communicate with animals. Educated clients are most helpful to their animal friends. 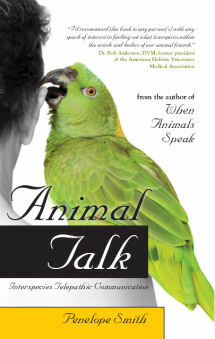 Read Animal Talk by Penelope Smith for a time-honored way to learn how.